The term Gable refers to the vertical wall that is bounded by two planes of a sloping roof. 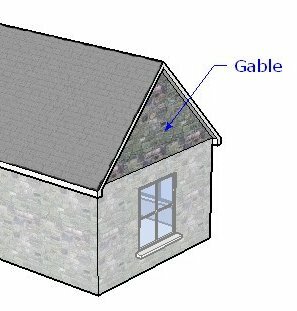 The term Gable as an adjective can also refer to a type of roof, commonly called a Gable Roof, but also known as a Pitched Roof. A roof is considered a Gable Roof if both ends have a Gable wall, if each roof plane is pitched at approximately the same pitch, and if the roof planes are flat, without a change in direction. A Gable Roof with significantly different roof plane pitches might be considered a salt box roof. A Gable Roof where one part of the roof plane is at a steeper pitch than the other might be considered a gambrel roof.